A fossil belonging to a 33 ft (10 m) dinosaur was unearthed in Egypt. The creature roamed today's desert 80 million years ago. 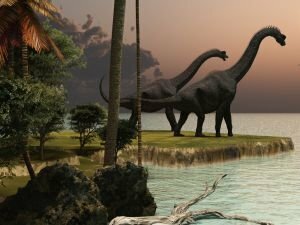 Newest articles and topics on Dinosaurs. Read about stories, mysteries and convenient advice when it comes to Dinosaurs. Get the newest reports and publications on Dinosaurs. A new paleontological find brings science one step closer to the mysterious world of the dinosaurs. It belonged to a gigantic three-toed creature, which according to researchers was a carnivore. Long ago, dinosaurs were the dominant animals on Earth. After thousands of theories about what led to their extinction, today we're asking: what gave rise to the reptiles? One of the last dinosaurs, living in Africa before the extinction of the giant lizards 65 million years ago was found in a phosphate mine in northern Morocco. Even though the official name the creature was given was Hatzegopteryx, it quickly became better known as the flying T-rex . The first dinosaur bone ever found was in 1676. At the time, the scientists thought that the remains belonged to an elephant or some other large animal. It wasn't until a century later that it became clear that the fossils belonged to a Megalosaurus. Antarctic researchers have made an unusual find. Over a ton of dinosaur remains lie within the soil of the continent. A species of triple-horned dinosaur, unknown until now, was discovered in the northern wilderness of Canada, writes the British Daily Mail. The horned reptile roamed the Earth approximately 89 million years ago. Russian scientists from Vladivostok have laid out a new theory about how the dinosaurs went extinct. According to them, the reason for it was the abrupt increase in earthly mass and gravity. The new theory proposes that our solar system entered into a gravitational interaction with this dark matter. The outcome was asteroids having their orbits changed and one of these heading toward Earth. The brontosaurus, one of the largest animals on dry land to ever walk the Earth, has been rehabilitated among the scientific community after having been classified as a species of Apatosaurus and not a separate species 10 years ago.